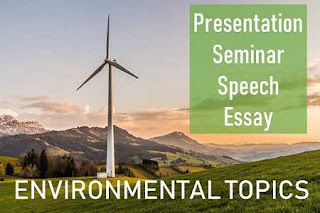 Here we present the comprehensive list of environmental topics for essay, seminar, and presentation. A society is the organization of people but the size and characteristics of any population depend upon the sustaining environment. These are best suggested environmental topics for students to learn and share knowledge through environmental studies projects. The list covers the topics from the natural environment, various types of pollution caused by human and their impacts, health issues, environmental policies, and programs.